Things you’ll want to take along when camping with dogs. The camping with dogs list I’ve put together are things that I found to be useful when I was camping with a dog. Your list may vary a bit depending on the type of dog you have a where you're planning to go camp. Before heading out to camp make sure all the necessary shots and vaccinations are up to date. Thinking back, the most difficult part of going camping with a dog was getting my camping gear and the dog to fit into the vehicle. Carefully selecting the most important gear to go camping was crucial. The leash is the most important part since that is how to control the dog and keep him from running off away from you while chasing something. Many dogs find the outdoors fascinating because of all the new smells and unfamiliar wild critters. A leash is a perfect tool to keep your dog away from a porcupine! You may be far away from a vet and those quills a dangerous for your dog. Many dogs don't learn from their first porcupine dog encounter either. A 6 foot long - 1 inch wide sturdy leather leash was best for Fritz. Wide nylon leashes are good too. For smaller dogs a retractable leash is great! They'll be able to explore new surroundings a bit more. When camping with dogs a tether is nice to have. It’s a great way to keep your dog near the camp but in an area with some cool shade. I’ve seen folks camping with multiple dogs using a tether. They kept the dogs close to accompany one another but just far enough apart keep the lines from getting tangled. 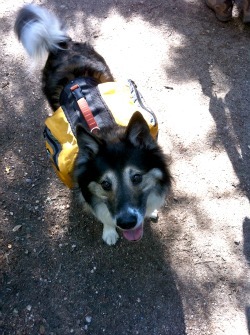 Maya loves to camp and hike. A wonderful dog that adores people. leather one was used. It should have a good buckle since they easily break and come apart while hiking. I’ve seen lots of dog owners use a muzzle while hiking and camping with dogs. I never had one for Fritz but I think it’s a great piece of equipment to have! The muzzle helps keep your pet from biting other people or animals but leaves enough room to drink water and chew on a treat. A walk or hike while camping with dogs is a must. Having a harness is great! The harness helps keep the leash between the dog’s shoulder blades and doesn’t droop down getting wrapped around the legs as often. 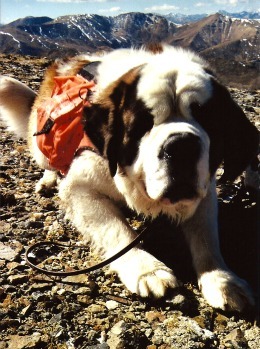 The harness also is less stressful when on the dog’s neck when he pulls you along while walking or hiking. Have a look at the dog tags. Make sure they are not worn out and the dog’s information can still be read. Tags can easily get lost when a dog runs through the bushes. Before heading out to camp have a tag made with “your” information and phone number. Doing that came in real handy for me once when we got separated on a hike in the mountains. Fritz looked a lot like a large wild animal while running through the forest. I didn’t want him shot while camping and hiking during hunting season. The orange pack was also a perfect place to store his many large oversized treats. Having flea/tick collar works well for a smaller dogs. I didn't have much luck with them for Fritz. Giving him a thorough brushing and inspection for insects was best. During one camping trip in western Nebraska, Fritz was completely black because he had so many biting flies on him. Using a little non-toxic insect spray repellent instead worked fine. I always took along 2 towels, one to wipe the slobber off his head and the other for his body. I always gave him a good drying off before heading back to camp after a swim. It helped his thick coat dry faster. To go camping with a very large dog is difficult if you have to bring your own water, since they need lots of it. 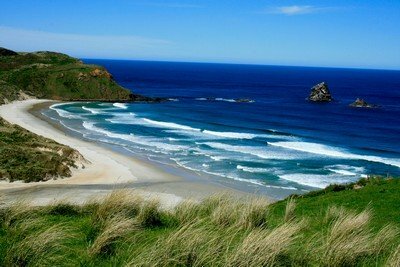 Fresh water is a must! Dogs get giardia just like humans do from the parasites and bacteria that can be found in small creeks and ponds. I always chose a camping area with lots of fresh, safe water nearby. If you have a normal sized dog, a portable drinking water dish is excellent to have along and highly recommended! 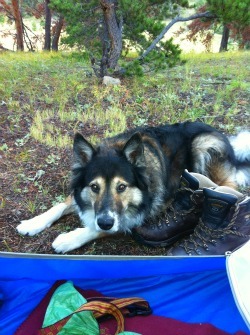 Camping with dogs like Maya is really easy! Don’t forget the food! Be sure to take a little extra since dogs will tend to eat more if they get more exercise. A few treats are great to have as well. A first aid kit is something I always have with me regardless. For the most part the bandages for humans work for dogs as well. As far as medications go: YOU need to know what and when to give your dog per your veterinarian's recommendations for your dog’s size. Scissors/razor-To cut out stickers and knots from his coat. Pliers-Or a Leatherman Tool with pliers, to pull out thorns. Tweezers-for ticks and other insects. Ear cleaning solution-Floppy eared dogs tend to get a lot of dirt and bugs in there. Cleaning out the ears keeps the dogs from shaking their heads all night giving you a sleepless night. Brush and comb-I always had them along to keep the dog looking good. That way I didn’t have to brush him at home after a long trip. Tablets for giardia-Those came in handy. Does your dog require any regular medications? Doggie bags-To clean up after your dog. I always kept a roll of them on his collar, that worked great! Blanket or dog sleeping mat: Maybe even a portable dog house? Fritz always slept on the ground because he liked it cold. He often slept outside during winter. However, your dog might need to stay warm at night so bring something along for him to sleep on. The ground can get very cold. Don’t let your dog shiver! Fritz was so large he didn't fit in the tent so he had to sleep outside. Placing a tarp over the picnic table on three sides worked great for protection as he slept under the table. 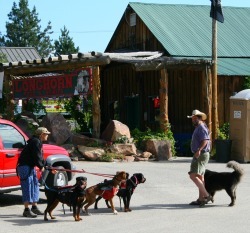 On our September camping trip to Yellowstone National Park I saw several people that brought along a portable dog house equipped with a portable heater inside. This is an option if you have lots of room in your vehicle. Most of my friends invite their dogs into the tent with them. If your pet loves a good game of catch bring along the frisbee or a tennis ball. When camping with dogs, things to chew on are great during quiet hours in the campground. A bone will keep a dog busy for quite awhile. 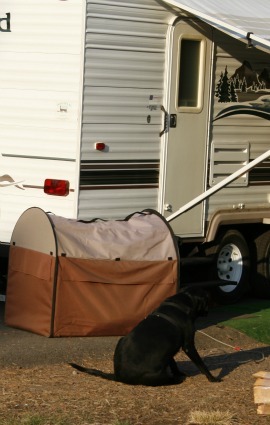 When traveling with your dog in the back of a truck it is safest if the dog is inside a dog carrier. I have seen leashed dogs jump or fall off the side of a truck while traveling down the highway. Please don't let that happen to your dog. Click here to head back to the camping with a dog main page from the camping with dogs equipment list page. Hopefully you've found the camping with dogs section helpful. By no means should the information be taken as gospel. I am not a dog trainer, veterinarian or any sort of animal expert. Although I do love dogs I am NOT a dog expert. I have never had my own dog, however I did spend a lot of time caring for and camping with a dog. 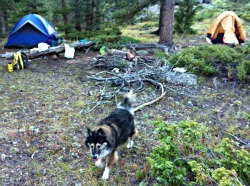 Your camping with a dog experience will most likely be completely different than mine. Your dog is YOUR responsibility.